England and Wales jail more offenders per capita than any other European, Union country, according to new figures. 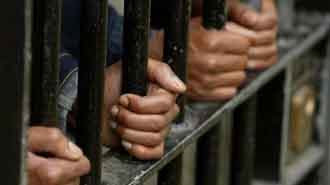 The imprisonment rate of 141 per 100,000 makes the countries the prison capital of Europe for the second year running. The data, published by the World Prison Population List, shows that the courts jail proportionately more people than Libya, Burma and Turkey, although it lags way behind the US, which at 701 per 100,000 has the highest jail population rate. France imprisons 93 per 100,000 of its citizens while Germany jails 98. On January 4, the English and Welsh prison population stood at 73,688 inmates, [prisoners], a rise of 2,729 in the past year, 25,000 up over the last decade. If that trend continues, the Home Office predicts a jail population of up to 109,000 by 2014. By far the biggest surge lies within the female prison population. Ten years ago, there were 1,811 women in prison. By last month, the figure had risen to 4,307, an increase of 140% in a decade. The magistrates courts have made the largest contribution. According to The Prison Reform Trust, a woman is now seven times more likely to be jailed by the lower courts, than she would have been in 1991. Custodial sentencing means 81 out of the 138 prisons are now officially overcrowded, but that this has failed to reduce levels of re-offending. Of those freed from prison, more than half re-offend within two years. The figure has risen to 80% among young offenders. Commenting on the figures, Juliet Lyons, Director of The Prison Reform Trust, said: "Holding the western European record for jailing people is nothing to be proud of, particularly since most return to crime after release. "Our prisons have become social dustbins and the only way to kick this costly habit is to invest in effective drug treatment, mental health care and community sentencing." A Home Office spokesman said: "As we have said many times, those people that commit serious offences - sexual offences, violent offences, those against children - should go to prison for a long period of time, but for those who commit more minor offences we should and do use non-custodial sentences and that is something we have been advocating for a while." If we are to arrest the soaring prison suicide rate among women, we need to look at alternative punishment. 'We will kill you. We will get away with it... we've done it before' Prisoners tell of hanging threats by officers holding nooses. In the documentary it is alleged an officer dressed in a Ku Klux Klan mask at a training centre in north-west England. An undercover reporter from the BBC also claimed to have taped racist comments by some officers. UK:The already overcrowded prison population is set to go on rising and will top 80,000 within the next three years, a senior Home Office civil servant warned yesterday. My Sarah was smart and talented - Why did she die in jail?